We have stayed in Del Rio long enough that it’s time to pay back a little of the kindness we have experienced. 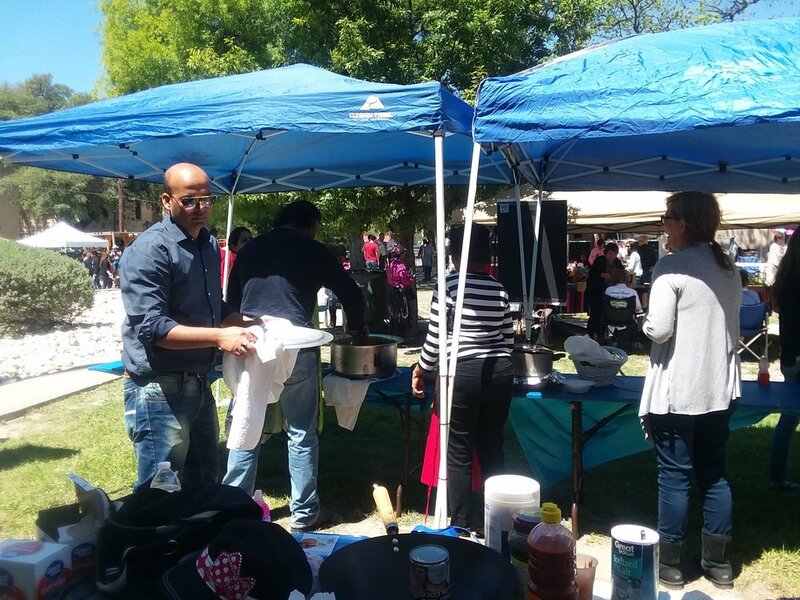 Today the Sacred Heart Catholic church was holding a giant fundraiser for their partner school across the border in Acuña, Mexico. There were hundreds of people involved, many of whom had volunteered to man stands selling food, jewelry, raffle tickets and rides. All of the money would go towards helping children and their families afford the school fees. Bob was involved peripherally and we asked him if we could help. His friend Saschi was in dire need of volunteers due to a last minute illness and we were happy to lend our energy to the effort! With no (visible) reservations, Bob handed us the key to his truck and told us to bring it back in a few hours when the church no longer needed us. Wow, Bob! What a guy. We loaded up with all sorts of warming pans and aluminum foil and plateware and drove over to the church where people had only just started setting up. It felt entirely luxurious to be back in a car again, especially after walking all over Del Rio for the last several days! Why are we doing this walking thing again? We knew we would be helping out Saschi at her Indian food stand but we had only met her briefly the night before and had no real idea of what we would be doing. No one else had arrived by the time we got there and we stood around awkwardly, tweaking the placement of the few items we had brought as the preparations around us progressed in a flurry of activity. At one point a gentleman approached, asked if we were here to help Saschi and, receiving an affirmative, handed us his phone. Saschi! She provided some rushed instructions and told us she would be there soon. After setting up the long tables and chafing dishes, it was time to get to work reheating the food. The church had a tiny skinny rectangle kitchen with an enormous oven and several burners taking up most of one wall. The small space was already packed with 4 women making gorditas for the very popular food stand just outside. Carrying an enormous vat of chicken curry with only the vague instructions to “keep stirring, but not too much” we shuffled inside, timidly elbowing our way through the maze of sweaty bodies. Someone shoved a hairnet into Tenny’s hand and she got to work. Claire kept at it outside, taping down the paper tablecloths as the wind snapped them back and forth. Emergency! Something important was all the way across town and we needed it. Claire subbed in for Tenny so she could get back in Bob’s car and drive to pick it up. Chaos ensued as we tripped over each other locating keys and hairnets and driving instructions. People were beginning to arrive and the local mariachi band was warming up right next to the kitchen. And apparently we had stirred the chicken a bit too vigorously - didn’t we know how to cook a good curry? Luckily we had a good team and everyone was plenty nice to the two clueless hikers from the east coast. Tenny retrieved the important item (a killer corn salad) and Claire figured out (mostly) how to stir just right. The food started selling and we kept at it, making new batches of coconut rice, watching the samosas cook, stirring the chicken to keep from burning and dishing out generous portions to the townsfolk wandering by. In between we chatted with our fellow volunteers, members of the small Indian community in Del Rio, TX. Bob arrived at some point lending some much-appreciated expertise to our haphazard cooking efforts. All in all, it was a great day. After being nomadic for so many months, it’s completely obvious to us how much we relish this feeling of community. Thank you Del Rio for letting us be a part of something today!